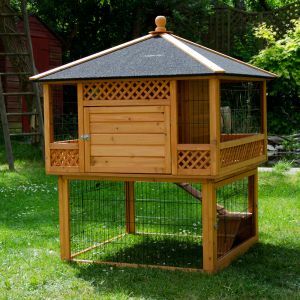 Ideas 4 Rabbit Hutches: A guide to choosing a Rabbit Hutch. The Trixie Natura Rabbit Hutch is a luxury home for your pet rabbits and a real eye catcher in the garden. This rabbit hutch is made from premium timber with many useful features, such as two levels, pull-out plastic tray and loft space. A Guide to Choosing a Rabbit Hutch. 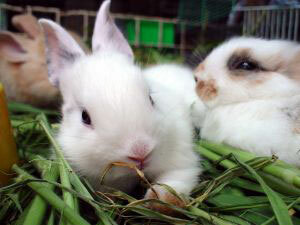 In the UK, rabbits are now the third most popular pet with an estimated 1.5 million of them in the nation's homes. Some of these rabbits live outdoors, year round, in large rabbit hutches with rabbit runs, some stay indoors in comfortable rabbit hutches and rabbit cages and some have even taken over the lounge and live just like a cat or a dog might, as a house rabbit. A Home for your Rabbit. 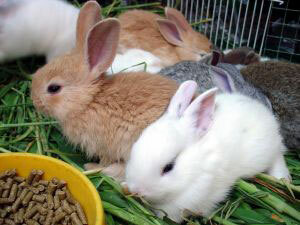 Rabbits can live in outdoor rabbit hutches or, as is becoming more popular, as indoor rabbits. Your pet rabbit can be just as happy living indoors or out, the key to having a happy rabbit is plenty of space for exercise, enrichment to keep them active in mind and body, and a healthy diet. When choosing a hutch for your buy the largest you can afford. The rabbit hutch should have a separate living area and bedroom to allow your rabbits enough space to stand up on their hind legs and stretch out. Long enough for your rabbit to take three to four hops from end to end. Wide enough for your rabbit to turn around easily and stretch out comfortably. Tall enough for your rabbit to be able to stand on its hind legs. And don’t forget, your rabbit can get fat and unhealthy if it doesn’t get enough exercise; you should consider getting a larger rabbit cage or rabbit run for your garden in addition to your rabbit hutch. The Rabbit Hutch Pagooda is an attractive rabbit hutch with a difference, featuring a patio and intregrated ground level rabbit run. 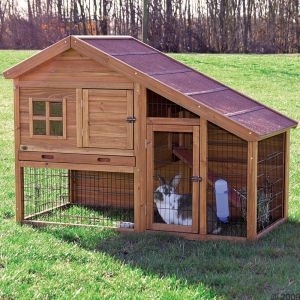 An ideal and unusual hutch for outdoor rabbits.